Mt. 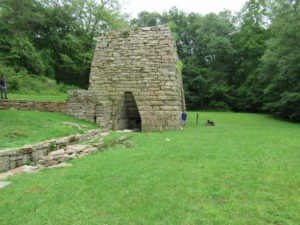 Vernon Furnace, summer 2017. Photo by Paul Davis. Fayette County has a prominent industrial history and has long been synonymous with the coal boom of the 19th and early 20th century. Growing up, I remember my mother telling me that Uniontown had contained a large number of millionaires; in 1907, at least 13 called the city home and their wealth grew out of the mining industry. 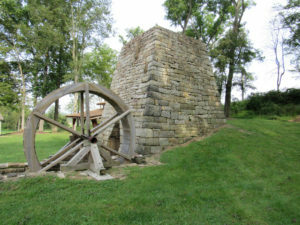 [i] Today, coal is still at the root of what the locals remember as “the good old days.” However, before mining played its hand in our area’s history, another industry thrived in Fayette County: iron-making. Iron has been utilized for thousands of years. People created numerous items using the material, including cooking utensils, money, and weapons. However, while it’s a naturally-occurring element, iron ore is not especially useful in its raw state. 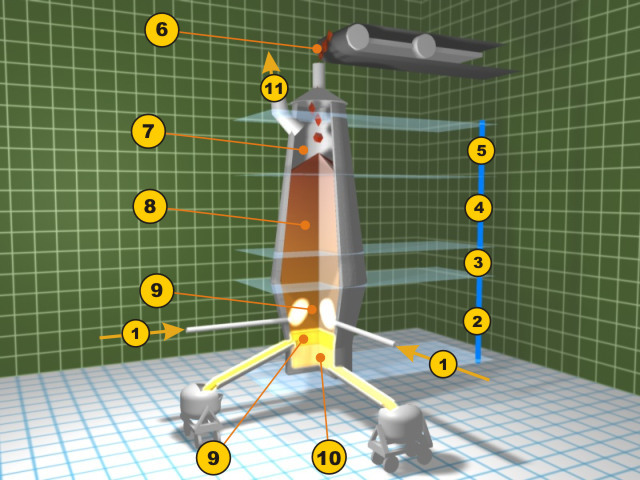 In order to make it stronger and more durable, it must first go through a chemical reaction to remove its oxygen content, a process that is achieved through an iron furnace. These structures began to dot the southwestern Pennsylvania landscape in the earliest days of pioneer settlement and would not go away entirely for nearly two centuries. Iron furnaces required a great amount of money and a large amount of land with the proper raw materials. 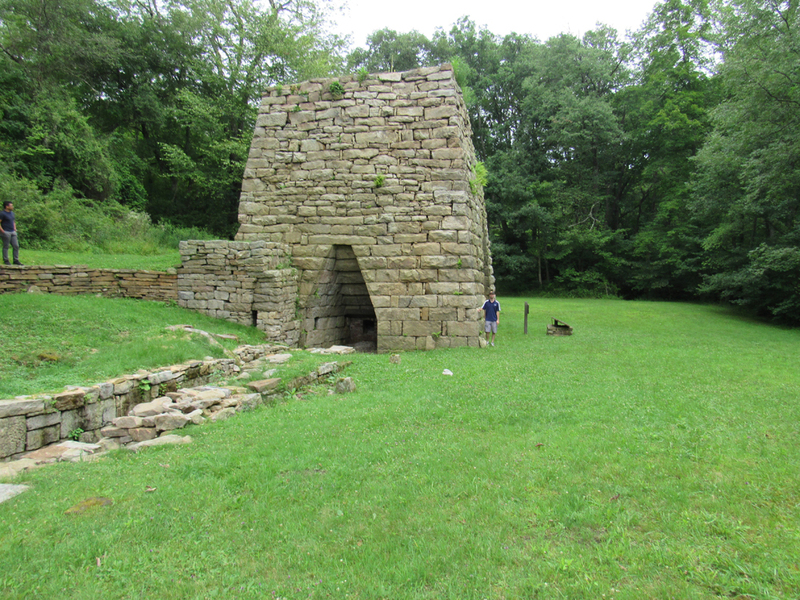 Accordingly, many early furnaces were erected near iron ore seams and wooded areas. Transportation away from the furnace was also taken into consideration. 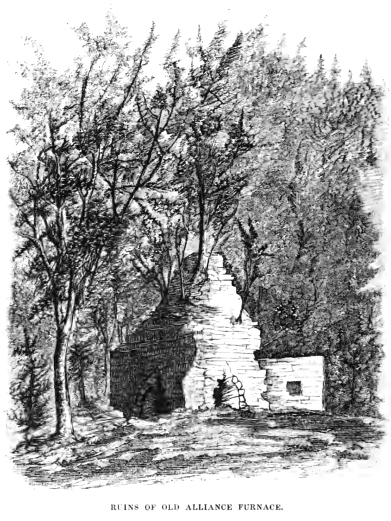 Building a furnace with easy access to roads was necessary in order to ship out the product to market, and many had to be near streams or runs because of the need for water power. [vii] Fayette County contained plenty of untapped natural ore. Moreover, its hills and natural streams made it an ideal location to pursue this rising industry. 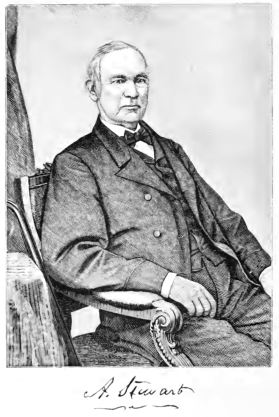 Andrew Stewart, the man who started Wharton Furnace in 1837. Source: History of Fayette County by Franklin Ellis, 1882. Ruins of Alliance Furnace near Jacobs Creek. Source: History of Fayette County by Franklin Ellis, 1882. Wharton Furnace, summer 2017. The author is standing to the right side for scale. Photo by Paul Davis. Wharton Furnace, summer 2017. Photo by Paul Davis. 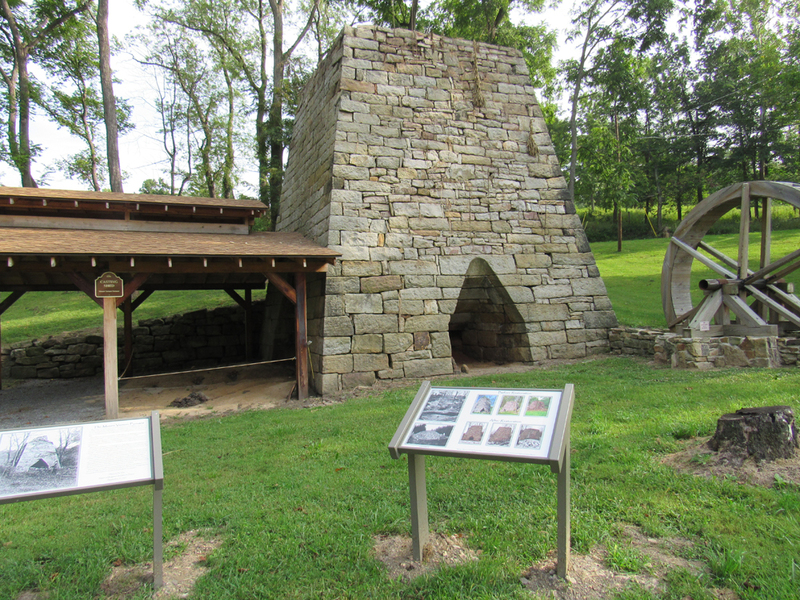 The iron furnaces of Fayette County were extremely important to the growing industry of the nation. Iron helped build and arm the nation in its most dire times and Fayette County and Western Pennsylvania in general were at the forefront. Even as the iron industry was being overtaken, steel moved in and continued to let Western Pennsylvania build the country. In addition, the importance of the iron industry helped bring about Fayette County’s other main industry: coal. Coal that was mined in this area was turned into coke and fed the iron furnaces in the mid- 19th century. 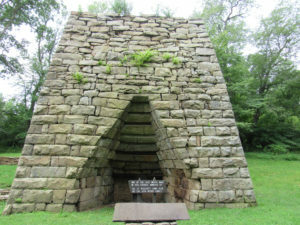 The abundance of iron furnaces in the area may have started a chain reaction that helped Western Pennsylvania become a leader of industry throughout much of its history. [xvii] Fayette T & R Bureau. 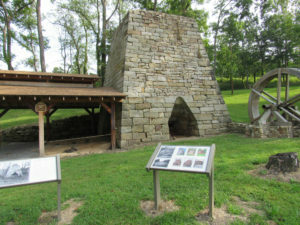 Old Iron Furnaces and elated Works in Fayette County in the Laurel Highlands. Uniontown , PA: Fayette County Development Council. [xxiii] “History of Mt. 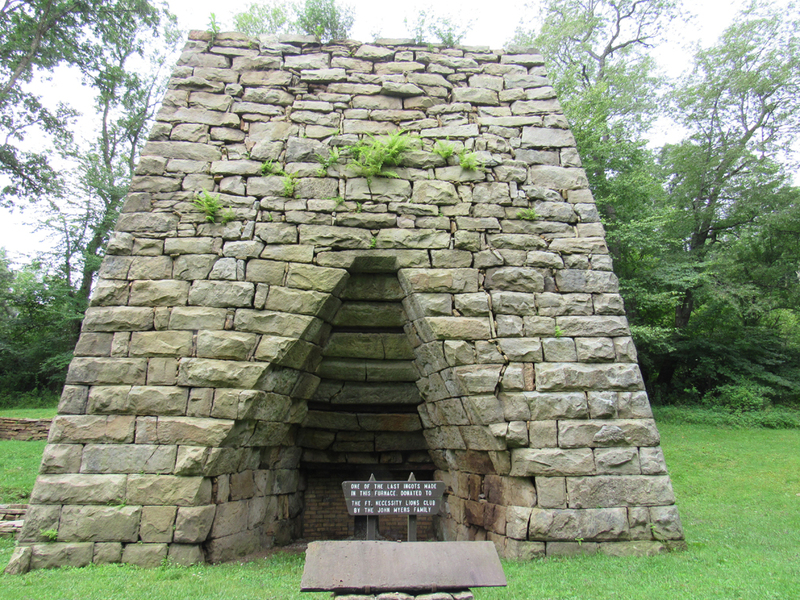 Vernon Furnace,” Bullskin Township Historical Society, 2017, accessed July 8, 2017, http://www.bullskintownshiphistoricalsociety.org/mt__vernon_furnace.